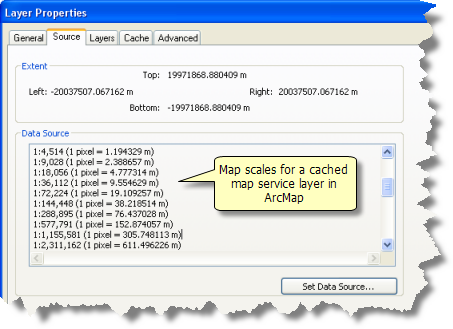 When ArcMap draws a cached map service, it makes a server request that includes properties such as the desired map extent and the map scale. ArcGIS Server uses this information to determine which prerendered cache images to send back to ArcMap. The server does not recompute the map display. Instead, it simply retrieves the tiles for the appropriate map scale that have been precomputed and stored on the server. The server sends only the images you need for display at the appropriate screen resolution. Cached map services are created at specific map scales. The scales for cached services are listed on the Source tab on the Layer Properties dialog box for the service layer. 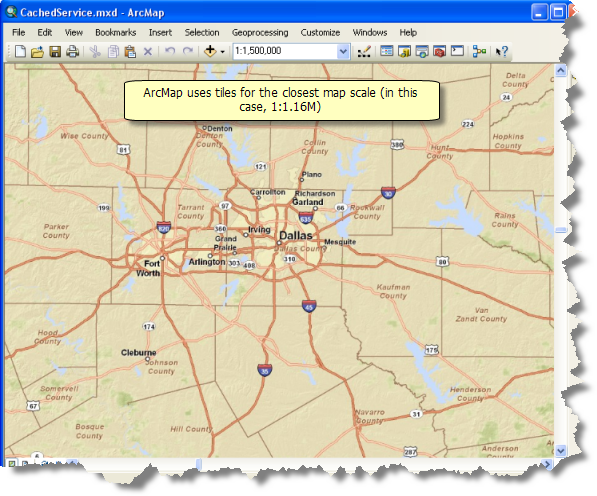 In ArcGIS Desktop, you are not restricted to these specific map scales. You can still zoom to any scale you want. However, since no new images are created by the server, ArcMap displays cached images from the closest available cache scale. To jump to the most appropriate scale for your current view, right-click the service layer and click Zoom to Nearest Cache Scale. The Layer Properties dialog box for the map service you add in ArcMap lists map scale information about the map cache properties on the Source tab. As you pan, zoom, and navigate to any desired map scale, ArcMap displays the cached images closest to your display scale in ArcMap. Advanced options are limited for a cached service layer. You cannot make any color other than the background color transparent for a cached service layer. The image type of cached map services is set by the service author. As a user of the service, you cannot change the image format. When a cached service is in PNG32 format, you cannot make the background opaque, while the background of a cached service in JPEG format is always opaque. You can add transparency to the entire layer. This allows you to see map features that lie underneath the layer. You can only add transparency to the entire service layer, not to sublayers.